The Erie Resistor Story, written by John Ball and Tom Clarke. 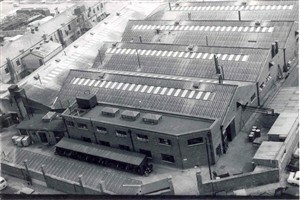 In mid 1943 Arthur Dyson, Managing Director of Erie Resistor Limited UK, visited a factory at nearby Lowestoft to a view of moving his family and business there from London. Since the outbreak of WWII part of the factory had been taken over by the Royal Navy as its base for the Patrol Service. It was in a bad state of disrepair and not considered suitable. After his visit Arthur had lunch at the Star Hotel as he left he looked at his watch and realised he had an hour or two left spare before his train left for London. Glancing around he saw the town hall and on a sudden impulse decided to check whether any other suitable sites were available locally. As he entered he saw a likely looking man and asked if he could help. To his surprise he was ushered into an office and given the keys to a property situated at the South end of town. The factory in question, situated between the promenade and river, was originally built as a rope factory to meet the demand for rope in the local fishing industry in the days of sailing vessels. More recently it had been used as a footwear factory by the Millar Slipper Company, which prior to the outbreak of war they had moved up North to Cockermouth. Following the heavy bombing in 1941/42 the building had been used to store furniture from bombed-out properties, awaiting the re-housing of the unfortunate occupants. The area around comprised large open spaces, where in peace-time barrels for the cured herrings were packed and work-benches erected during the Autumn fishing season for Scotch Fisher girls, who gutted the fish prior to packing it, with a good sprinkling of salt, into the barrels. There was also a small building between the factory and Nelson's Monument, which had the potential to be converted into a makeshift office area. In addition to this, nearby was the Nelson Tavern, with adequate facilities for social events. Mr Dyson was impressed and immediately made up his mind to move his business to the site. By late 1943 equipment was being installed to supplement a workforce of experienced personnel from London. The reason for the move soon became obvious as the business expanded with the ever-increasing demand for radios and other equipment needing electronic components. The Fryling family established the Erie Resistor Company at Erie, Pennsylvania on the shores of one of the Great Lakes in North America, and formed the UK branch in 1932. On Christmas Eve of that year a factory was set up in Cricklewood, North London, and initially carried out the finishing off of resistors, which were partly assembled in the USA. In 1936 they moved to Carlisle Road and, with imported machinery, by 1938/39 they went into full production, carrying out all the assembly. By 1937 as well as radios and the development of early radar systems etc. the demand for electronic components increased and Erie Resistor were carried along in its wake. The majority of components used were either resistors or capacitors, most of which could be supplied from their range. At the outbreak of war in 1939 production was initially stepped up by using empty shops in the Harrow area and later taking over the Marmet pram factory in Letchworth, increasing the area to 60,000 square feet. When even further space was required, because of excellent co-operation with the government, more help was given. With the demands from all the services for radar, communication, code breaking, use in early computers and submarine detection equipment, production further increased. Also included were systems to counter the use of the Lorenz systems of radio beams being used by the Germans to direct their bombers accurately on specific targets and I.F.F. used by our own planes. In early 1942 a committee headed by Sir Stafford Cripps was set up to study reports that the Germans were developing rocket bombs and unmanned Ballistic Missiles as they would undoubtedly be aimed at the London area and urgent action was necessary to protect our essential industries around the capital. Erie Resistor was one of the firms that came under this survey. Initially little headway was made as more important issues were considered a priority and the committee was wound up. Ironically within a few days the first V1 missiles started to arrive and the committee was immediately "unwound". Alternative sites were quickly found for the factories, hence Mr Dyson's visit to Lowestoft and Great Yarmouth. As far as Great Yarmouth was concerned this was certainly a case of "being in the right place at the right time". Before the war Johnson's Industrial Clothing, Grouts Silk Factory, and Millars Slippers etc took up most of the female labour in the town. Erie was able to offer further employment for female workers and, as the wages they offered were based on London rates, women who previously had worked as shop assistants were attracted to work there. At that time Great Yarmouth had a population of around 60,000 a third of which, about 20,000 were children or pensioners. Out of the 40,000 people left after this deduction at its peak in 1972 Erie employed 4,000 production personnel and 250 office staff - this accounted for over 10% of the labour force, surely the largest employer ever in the town. Like the fishing fleet fraternity 50 years earlier very few people could not count at least one member of their family who was employed by the company. The foremost was the South family who had no less than six daughters working for Erie at the same time, followed by the Rose family that had one son, two daughters and their father working at the factory. This page was added by Laura Matthews on 11/01/2008.